Hot news this year at this year's Swanage Jazz Festival was that next year, after 28 of them, is going to be the last one for what has been described as the beating heart of the British jazz scene from the traditional opening New Orleans street parade led by the ever present Dave Brennan Band from Sheffield, to the outer edge of the music, with space ,always, for younger bands like, this year, the Henry Spencer Juncture and several Youth and school big bands. What follows is inevitably a snapshot of a few of the fifty plus shows held in two marquees overlooking the sea, the Methodist Church, and a few pubs for fringe events. Reliable witnesses are free to augment my own Desert Island Discs selection. Top of my favourites was Art Themen's New Directions, steadily warming and building a good crowd in the Sunday morning slot. Art, still one of the most adventurous and edgy saxophonists leads a magnificent band with Steve Fishwick,a quicksilver trumpet player and a wonder rhythm section of Gareth Williams (pno) Arnie Somogyi (bs) and drummer Winston Clifford, absolutely in his element on a big stage with a fine sound system, turning on a thrilling performance on material by legends like Dexter Gordon, Thelonious Monk , Charles Mingus and Joe Chambers. Throw in a ballad selection with echoes of masters like Coleman Hawkins, Don Byas and Lucky Thompson and we had the perfect storm of a set. Friday night the main tent was rammed to hear Ian Shaw ,who killed us all with his wicked,off the cuff humour - a foray into Johnny Mathis land was just brilliant. Another song about crap singers ruining good songs had the crowd weak with laughter and yet Here's To Love and his own song My Brother ,inspired by the death of his own brother and now synonymous with his work on behalf of refugees in Calais, demonstrated once again for the benefit of delusional fools who only perceive him as a 'fun' entertainer, that here was a serious and moving artist, unique in the nation's musical life. Quite magnificent. Having seen Shaw on several occasions none of the above was exactly a surprise, but given my usual slightly jaundiced response to fashionable exotica to be bowled over the next afternoon by the virtuoso clarinettist Arun Ghosh whose thrilling mix of Indian melodies and an almost rock band feel of a splendid duo Dave Walsh (drums) and Liran Donin (electric bass) was ,for me one of the great surprises of the weekend. Once again a genourous-and packed- crowd showed that they will respond to something very different if it makes musical sense. The unexpected appearance of master tabla player Nilesh Gilhane seemed to cement the idea that we were in on something special which, along with utterly engaging personality of the Bolton born leader produced a wonderful and refreshingly different show. Probably there were logistical reasons but it was a puzzling decision to put Tim Garland's new triple A list band, Jason Rebello, Ant Law and Asaf Sirkis in the church ,particularly as the programme promised us more than a smidgeon of Garland's 'rocky side'. If ever a band cried out for a big stage ,strong sound system and a lighting rig ,this was it. I mean, they even brought their own sound engineer and how often does that happen on the local scene? Nevertheless a fine satisfying set with Tim Garland 's authoritative,beautiful playing demonstrating just why Chick Corea likes him so much. A tenor saxophone ballad feature drew out one of the most exquisite sounds I have heard in a very long time and despite being restricted by the acoustic of the room Sirkis's multi-rhythmic wizardry was riveting. At least one musician opined that this,for all its limited qualities was the set of the weekend. Easy to overlook the 'Trad Tent' a paralell universe that exists alongside the modern/mainstream tent in another large marquee which contains fans not markedly different in age and appearance in the venue next door. In truth the splendid TJ Johnson Band could have played anywhere with leader's Louisiana drawl sounding completely authentic and not, as you might expect ,cringeingly phoney. Always one of the treats for me when he is booked for the Festival as is Keith Nichols' Blue Devils Orchestra,this year presenting early Fletcher Henderson arrangements as well as creaky novelty numbers such as Skeleton in the Closet an old Armstrong number from an early Bing Crosby film. Keith always has some historical gem up his sleeve and in introducing this old piece he pointed out that the song was banned by the BBC until the title substituted the word Cupboard. Wearing his erudition lightly this is a man who should be touring every jazz conservatoire in the land. Can't leave this area without reference to the amazing blend of statuesque presence and animated projection that is the band's singer Joan Viskant . Why she is not more of a presence on the scene in general I simply do not understand. Elsewhere there wa s a feast of Basie/Ellington served up by the Colin Skinner/Matt Skelton Band that brought me enthusiastic comments, as did did a great set from Tony Kofi/ Alan Barnes as well as pianist Dave Newton's role in stoking up a fire under the ever popular visitor to these annual assemblies US alto Greg Abate. 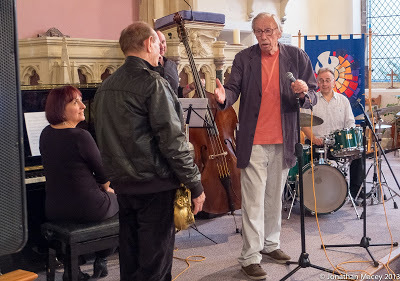 One plea to the incredible Fred Lindop and his crew: if there is a pot of money left in the Festival's account next year please spend it on Robert Fowler's recreation of the Mulligan Concert Band . If a small Festival like Southport's Winter Weekend can afford them then so can you.